This was the first segment of our Back to Back cruise, ending with the Trans-Atlantic to Fort Lauderdale. We arrived in Barcelona several days early to give us a chance to sightsee and get used to the time zone. The flight from Orlando-Frankfurt was an incredible nonstop. We booked through Choice Air, getting a Lufthansa Premium Economy for a third of what Lufthansa had on their website. Premium Economy is my definition of first class: wide seats, huge legroom, eye masks, blankets, extra checked bags, seating two-across, menu selection for dinner and breakfast, unlimited wine (which we didn&apos;t drink). Be aware that Frankfurt airport involves a lot of walking to get to the domestic side. We must have slept on the plane because we had no jet lag issues. This was our second/third X cruise. Ship: Everyone on staff seemed genuinely happy we were there. They always had a "Good Morning" and a big smile. Folks were always cleaning, wiping things down, picking up litter. The ship is quite smooth especially when docking and leaving. Very little vibration or noise. Cabin: 8192 Deluxe Veranda; category 1C. We didn&apos;t really use the veranda, mostly to check the temperature outside. The cabin was very quiet, midway between the two elevator areas. We had the adjoining configuration and the hallway doors were open. The cabin had many closets and cubbies we didn&apos;t even use. Our suitcases fit under the bed (A CC suggestion.) We brought our magnets and they came in quite handy to keep our paperwork in control and clipped to the wall instead of getting lost on the desk (Another CC suggestion.) The cabin steward and assistant were super. They were always busy and raced to open our door before we could get to it. We heard a rumor that X was changing the cabin staff to just one Attendant per cabin. Hopefully, they will also lower the number of cabins each attendant needs to clean. Will that change the gratuities we pay or they receive? Himmm. The Internet speed improved when I moved my Kindle to a few inches from the cabin door despite there being a Cisco wireless unit a few doors away. The solid shower doors made the shower compartment spacious. We had more clothes hangars than we could use. The provided pillows were quite flat so we asked for contour pillows, which were much better. Internet and the Celebrity Survey: At the end of the cruise, Celebrity has a survey that&apos;s only available for 7 days. If you are B2B, they leave special instructions in your cabin for how to complete the survey and get 30 free minutes of Internet time. The instructions made no sense and we went to the I-Lounge, where the Apple dude disabled our account, enabled us to complete the survey on their Mac with their 30 minutes, then re-enabled the account. Dining: We had Select Dining in the MDR, which takes up the entire 4th deck of the MDR. We always asked for a shared table and were seating with different folks in different places each time. On a previous cruise on the Equinox, we had Select dining with a reserved table. We were seated by 5:45 and out in time for the 7 pm show. This time the service was slower. We were rarely out by 7:30. Maybe X has cut back on some dining staff?? The food was always super and it was nice having shrimp cocktail each evening. We had no concerns with the dress code. Long sleeves were fine. Quite a few folks were really dressed up in suits and tuxes. The ladies, of course, always looked smashing. For breakfast and lunch, we most always ate in the Oceanview Cafe. You can get it yourself or they&apos;ll custom cook you most anything. Omelettes in the morning, steak, pork or chicken for the other meals. Sometimes the Cafe had nationality nights and all the food was labelled. The desserts were always a massive spread. Activities: Everyone enjoyed picking on Cruise Director Alejandro, including himself. Justin, his assistant, seemed to work all day and all night, and he still was enjoying himself. The evening shows were great. Since this was a 9 day cruise with 7 ports, we really didn&apos;t have time for activities beyond the evening show. Ports: Barcelona, Palma de Mallorca, Malta, Sicily, Amalfi Coast, Rome (Civit), Corsica, Livorno (Florence, Pisa). All of the ports were new to us, so we just took general, overview tours. Barcelona: On the first day, we went to the tourist information place under the Catalunya Square. We bought tickets for the Hop-On, Hop-Off, telling them we were pensioners, saving a few Euros. We already had our Sagrada Familia skip-the-line tickets we purchased a few months earlier for 3:30 pm. We had no problems with the Ho-Ho, using it to take us to the Sagrada, which we walked around until they let us in. We had purchased the audio guide option, which was helpful. We spent maybe an hour there and there was no line to get back on the Ho-Ho. Since the weather forecast for the next day was good, we went back to the Tourist Info place and bought tickets for Montserrat and the tour bus. That was also quite interesting. Palma: The city had a marathon race that day, making transportation a bit interesting. The tour guide decided to go to Soller first, then head back to Palma. Great idea. The van had serious trouble getting to us in the city, what with the marathon. We ended up walking a whole lot more than expected and made it back to the ship with 15 minutes to spare. Valleta Malta. We went to Mdina, then back to the city. It sure made it easier taking the free elevator down to the port, but the way the port is laid out, we ended up walking about two miles from elevator to the ship. Messina Sicily: I recommend NOT taking the cable car to the higher levels of Mt Etna. Salerno Amalfi Coast: I guess all the bad shuttle bus drivers are dead! They really know how to drive around those curves. Pompeii was fantastic and involved a lot of walking over rough surfaces. 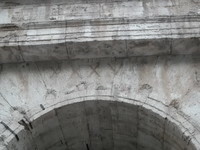 Rome (Civit): We had a note in our cabin the evening before that the Italian transportation workers would be on strike the day we were there. That didn&apos;t affect our tour, maybe delaying it just a bit. Corsica: This was the only X tour we took, to Prunelli Gorges. We needed to burn off our OBC. We were surprised that X used full size buses, given the width and curves of the road. Livorno (Florence/Pisa): Another beautiful stop. We walked all over both places and had a great time. Safety: We took the CC warning about pickpockets to heart and we each had a moneybelt with a copy of our passports and minimal currency and plastic. We never felt threatened. Embarkation/Debarkation: Embarkation was smooooth in Barcelona. We arrived at 10:00 and got on the ship soon after. The cabins opened a bit early and our luggage arrived before the muster drill. Sicily, Mount Etna. A crater you can walk around. Florence Gelato. I couldn't get enough! This was the first segment of our Back to Back cruise, ending with the Trans-Atlantic to Fort Lauderdale. We arrived in Barcelona several days early to give us a chance to sightsee and get used to the time zone. The flight from Orlando-Frankfurt was an incredible nonstop. We booked through Choice Air, getting a Lufthansa Premium Economy for a third of what Lufthansa had on their website. Premium Economy is my definition of first class: wide seats, huge legroom, eye masks, blankets, extra checked bags, seating two-across, menu selection for dinner and breakfast, unlimited wine (which we didn&apos;t drink). Be aware that Frankfurt airport involves a lot of walking to get to the domestic side. We must have slept on the plane because we had no jet lag issues. This was our second/third X cruise. Ship: Everyone on staff seemed genuinely happy we were there. They always had a "Good Morning" and a big smile. Folks were always cleaning, wiping things down, picking up litter. The ship is quite smooth especially when docking and leaving. Very little vibration or noise. Cabin: 8192 Deluxe Veranda; category 1C. We didn&apos;t really use the veranda, mostly to check the temperature outside. The cabin was very quiet, midway between the two elevator areas. We had the adjoining configuration and the hallway doors were open. The cabin had many closets and cubbies we didn&apos;t even use. Our suitcases fit under the bed (A CC suggestion.) We brought our magnets and they came in quite handy to keep our paperwork in control and clipped to the wall instead of getting lost on the desk (Another CC suggestion.) The cabin steward and assistant were super. They were always busy and raced to open our door before we could get to it. We heard a rumor that X was changing the cabin staff to just one Attendant per cabin. Hopefully, they will also lower the number of cabins each attendant needs to clean. Will that change the gratuities we pay or they receive? Himmm. The Internet speed improved when I moved my Kindle to a few inches from the cabin door despite there being a Cisco wireless unit a few doors away. The solid shower doors made the shower compartment spacious. We had more clothes hangars than we could use. The provided pillows were quite flat so we asked for contour pillows, which were much better. Internet and the Celebrity Survey: At the end of the cruise, Celebrity has a survey that&apos;s only available for 7 days. If you are B2B, they leave special instructions in your cabin for how to complete the survey and get 30 free minutes of Internet time. The instructions made no sense and we went to the I-Lounge, where the Apple dude disabled our account, enabled us to complete the survey on their Mac with their 30 minutes, then re-enabled the account. Dining: We had Select Dining in the MDR, which takes up the entire 4th deck of the MDR. We always asked for a shared table and were seating with different folks in different places each time. On a previous cruise on the Equinox, we had Select dining with a reserved table. We were seated by 5:45 and out in time for the 7 pm show. This time the service was slower. We were rarely out by 7:30. Maybe X has cut back on some dining staff?? The food was always super and it was nice having shrimp cocktail each evening. We had no concerns with the dress code. Long sleeves were fine. Quite a few folks were really dressed up in suits and tuxes. The ladies, of course, always looked smashing. For breakfast and lunch, we most always ate in the Oceanview Cafe. You can get it yourself or they&apos;ll custom cook you most anything. Omelettes in the morning, steak, pork or chicken for the other meals. Sometimes the Cafe had nationality nights and all the food was labelled. The desserts were always a massive spread. Activities: Everyone enjoyed picking on Cruise Director Alejandro, including himself. Justin, his assistant, seemed to work all day and all night, and he still was enjoying himself. The evening shows were great. Since this was a 9 day cruise with 7 ports, we really didn&apos;t have time for activities beyond the evening show. Ports: Barcelona, Palma de Mallorca, Malta, Sicily, Amalfi Coast, Rome (Civit), Corsica, Livorno (Florence, Pisa). All of the ports were new to us, so we just took general, overview tours. Barcelona: On the first day, we went to the tourist information place under the Catalunya Square. We bought tickets for the Hop-On, Hop-Off, telling them we were pensioners, saving a few Euros. We already had our Sagrada Familia skip-the-line tickets we purchased a few months earlier for 3:30 pm. We had no problems with the Ho-Ho, using it to take us to the Sagrada, which we walked around until they let us in. We had purchased the audio guide option, which was helpful. We spent maybe an hour there and there was no line to get back on the Ho-Ho. Since the weather forecast for the next day was good, we went back to the Tourist Info place and bought tickets for Montserrat and the tour bus. That was also quite interesting. Palma: The city had a marathon race that day, making transportation a bit interesting. The tour guide decided to go to Soller first, then head back to Palma. Great idea. The van had serious trouble getting to us in the city, what with the marathon. We ended up walking a whole lot more than expected and made it back to the ship with 15 minutes to spare. Valleta Malta. 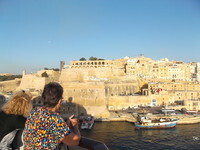 We went to Mdina, then back to the city. It sure made it easier taking the free elevator down to the port, but the way the port is laid out, we ended up walking about two miles from elevator to the ship. 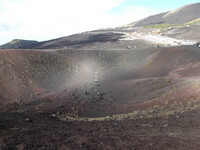 Messina Sicily: I recommend NOT taking the cable car to the higher levels of Mt Etna. Salerno Amalfi Coast: I guess all the bad shuttle bus drivers are dead! They really know how to drive around those curves. Pompeii was fantastic and involved a lot of walking over rough surfaces. Rome (Civit): We had a note in our cabin the evening before that the Italian transportation workers would be on strike the day we were there. That didn&apos;t affect our tour, maybe delaying it just a bit. Corsica: This was the only X tour we took, to Prunelli Gorges. We needed to burn off our OBC. We were surprised that X used full size buses, given the width and curves of the road. Livorno (Florence/Pisa): Another beautiful stop. We walked all over both places and had a great time. Safety: We took the CC warning about pickpockets to heart and we each had a moneybelt with a copy of our passports and minimal currency and plastic. We never felt threatened. 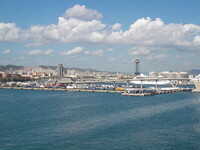 Embarkation/Debarkation: Embarkation was smooooth in Barcelona. We arrived at 10:00 and got on the ship soon after. The cabins opened a bit early and our luggage arrived before the muster drill. We didn&apos;t really use the veranda, mostly to check the temperature outside. The cabin was very quiet, midway between the two elevator areas. We had the adjoining configuration and the hallway doors were open. The cabin had many closets and cubbies we didn&apos;t even use. Our suitcases fit under the bed (A CC suggestion.) We brought our magnets and they came in quite handy to keep our paperwork in control and clipped to the wall instead of getting lost on the desk (Another CC suggestion.) The cabin steward and assistant were super. They were always busy and raced to open our door before we could get to it. We heard a rumor that X was changing the cabin staff to just one Attendant per cabin. Hopefully, they will also lower the number of cabins each attendant needs to clean. Will that change the gratuities we pay or they receive? Himmm. The Internet speed improved when I moved my Kindle to a few inches from the cabin door despite there being a Cisco wireless unit a few doors away. The solid shower doors made the shower compartment spacious. We had more clothes hangars than we could use. The provided pillows were quite flat so we asked for contour pillows, which were much better. Make sure you&apos;ll have good weather. You can take your time, especially with the audio guide. Late afternoon seemed to be less crowded. Walked around Pisa, then spent the rest of the tour in Florence, eating gelato! This was a Cruise Critic tour. Make sure your have pre-purchased your Vatican tickets. The place was packed.